Burritos La Palma is easy to miss, yet in plain sight. The specialty Mexican restaurant -- nestled in a strip mall between a dentist and the newly widened Bristol Street at Santa Ana Boulevard -- is full of authentic flavors and colorful history. Inside, you won’t find gaudy primary colors or papel picado, instead you’ll find simple and clean earth-tone tables with seating. For food, the menu above the order and cashier counter offers only four food categories: tortas, flautas, quesadillas, and burritos. Evident in the name, these little beauties are La Palma’s claim to fame and are perfect for students and those looking for something fulfilling and snackable. 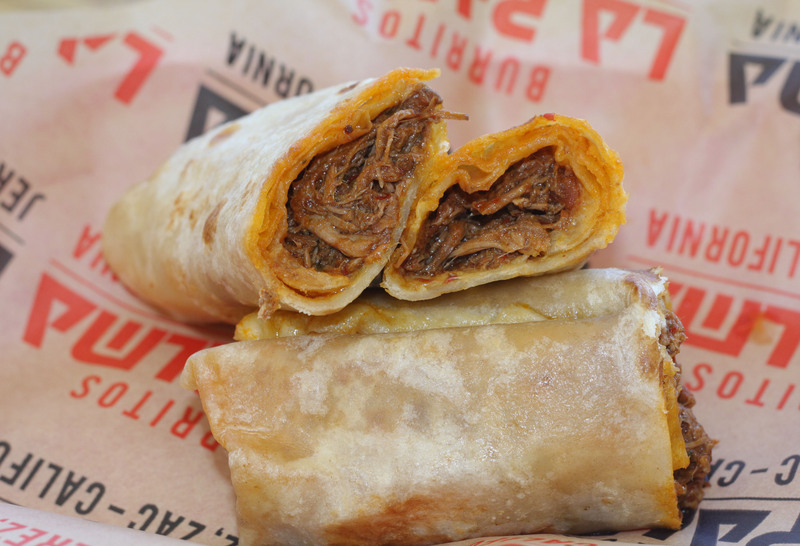 Burritos La Palma has accumulated a few awards over the years for its L.A. locations, though founder and owner Alberto Bañuelos strives to stay humble among the praise for his modern spin on food from the Mexican state of Zacatecas. The food worth going the distance for is characterized by the unique, handmade flour tortillas — a family tradition brought from Jerez by Bañuelos — and the birria de res, which substitutes the traditional goat meat with beef. Their style of cooking leaves the meat so tender it falls apart in your mouth, so juicy you’ll most definitely need a napkin, and married so well to the plush flour tortilla that it somehow manages to avoid sogginess — though you still might need a bib. Only about five and a half inches long, these rolls quite literally fit in the palm of your hand. Though the flavor makes up for the small size, the petite package is actually its strength, allowing for the perfect ratio of flour tortilla to meat and bean to cheese, which anyone can appreciate, regardless of familiarity with Mexican flavors. As a college student, “bargain” and “satisfying” are absolute key characteristics when looking for a bite to eat. Often, quantity overcomes quality when money and time is tight. Luckily, these burritos are small enough that you can’t just have one, and hearty enough that you’ll be more than happy throughout your study session. The folks at Burritos La Palma are more than enthusiastic about the people and community of Santa Ana, especially its community college students. “Come by, leave a suggestion. If I’m not here, leave it in writing, verbal, whatever. I would love to hear from the community, especially from the school,” Bañuelos says. Comments and feedback can be sent to burritoslapalma@gmail.com, and if you’re up for a challenge, you can always try to beat the 11 burrito record when you stop by. 410 N. Bristol St., 657) 266-0575. Open every day 11 a.m. to 6 p.m.